A simple salad that is so tasty and good for you too! A Summer Salad to Wake Up Your Taste Buds! 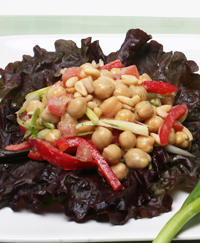 As tomatoes, basil and peppers begin to appear in farmers' markets, serve this healthy and easy to make chickpea, pepper and pine nut salad for a quick lunch or as a vegetarian entrée at dinner. The nutty chickpeas deliver protein and they are also high in fiber. The most recent reports from the AICR/WCRF put forth convincing evidence that foods containing fiber lower risk for colorectal cancer. In Italy roasted chickpeas are often sold by street vendors as snacks. Chickpea flour makes an excellent flour with which to make any number of recipes as well. 1 Tbsp. Earth Balance vegan "butter"
In medium mixing bowl, combine chickpeas, pepper, tomato and scallions. For creamy basil dressing, add soy or almond milk, Earth Balance, lemon juice and pulp, vinegar, oil and garlic to spice grinder or blender and process until blended well and creamy. Add basil and process again until leaves are minced. In a dry skillet over medium heat, toast pine nuts, stirring continually for about 2 minutes. Be careful not to burn them. Pour dressing over chickpea mixture and toss well to coat. Season with salt and pepper to taste. Spoon onto lettuce leaves. Sprinkle with pine nuts and serve. Steaming the basil: * In small skillet over medium-high heat, add 2 tablespoons of water and heat until steaming. Add basil leaves, cover and reduce to medium heat. Steam leaves for 1/2 to 1 minute and remove from pan immediately. Per serving: 160 calories, 6 g total fat (0 g saturated fat), 22 g carbohydrate, 7 g protein, 5 g dietary fiber, 45 mg sodium. The word basil comes from the Greek basileus, meaning king. It is believed to have grown above the spot where St. Constantine and Helen discovered the Holy Cross. When soaked in water, the seeds of several basil varieties become gelatinous, and are used in Asian drinks and desserts such as falooda or sherbet. They are used for their medicinal properties in Ayurveda, the traditional medicinal system of India and Siddha medicine, a traditional Tamil system of medicine. They are also used as drinks in Southeast Asia.